Close up of top of Seward’s Pole in Saxman, Alaska. The pole was carved by Stephen Jackson. Photo by Hall Anderson, used with permission. Renewing Seward’s shame pole in 2017 is significant, as it is the same year that the State of Alaska celebrates the 150th anniversary of the U.S. purchase of Alaska from Russia in 1867—a purchase largely orchestrated by William Seward. A few months after Tlingits dedicated the Seward shame pole in Saxman, a private party in Juneau dedicated a new bronze monument to Seward in the front of the State Capitol building. The speeches at the Juneau dedication hailed Seward’s vision for establishing an American territory in the North Pacific, even as they acknowledged that Seward ignored the claims of Indigenous people to the lands he claimed to buy. But there was no mention of the Seward shame pole that had been erected a few months earlier in Saxman, a pole that protested Seward’s lack of recognition of Indigenous peoples at an early point in Alaska’s U.S. history. The original version of the pole was erected at Tongass sometime in the 1880s, more than a decade after Seward had visited the Taant’a kwáan village, and after it was clear that he was not coming back to reciprocate the honors of the 1869 potlatch. 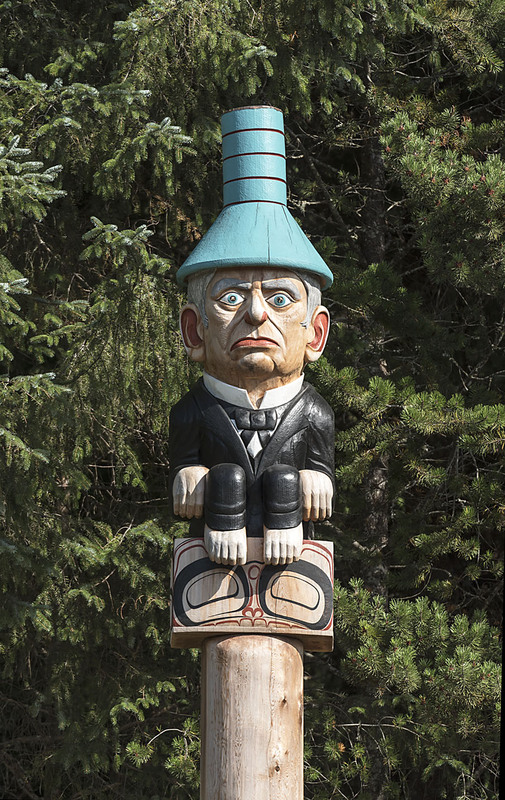 The original pole depicted Seward at the top of a plain shaft; he wore a hat carved to look like a spruce root potlatch hat (perhaps a symbol of his attendance at the potlatch) and sat on a bentwood box (perhaps a pointed reference to the many gifts he had received as Ebbits’s guest of honor). According to most accounts, Seward’s face on the totem pole was painted white, and his ears and nostrils red as a mark of shame. Sixty years later, long after Chief Ebbits had died and after most Taant’a kwáan Tlingits had moved to Ketchikan or Saxman, a second iteration of the Seward pole was erected in a new totem park at Saxman. Built by Tlingit men enrolled in the Civilian Conservation Corps (CCC), the Saxman totem park sought to attract tourists to see more than a dozen restored or replicated totem poles relocated from Tongass Island, Village Island, and Cape Fox. Ironically, the federal government included the Seward pole for replication in the Saxman park, although they did not realize that the pole shamed the Secretary of State until after they had paid the CCC carvers to replicate it! In 2014, after nearly seventy years of standing at Saxman, the CCC version of the Seward pole began to fall apart. Because Seward’s debt had still not been resolved, however, the City of Saxman decided to commission a third version, choosing local Tlingit artist Stephen Jackson to create the new pole. Jackson, who is well known for his original take on Northwest Coast art, chose to create a new iteration of the Seward figure that combined caricature and realism. Noting the long tradition of caricature in Northwest Coast depictions of Euro-Americans (like the famous Haida argillite sculptures of white sailors), Jackson depicted Seward with bulging head and eyes, sitting atop a body that seems to lean forward slightly (perhaps in his eagerness to “get the goods”). But Jackson also portrayed the famous stabbing wounds and broken jaw that marked Seward after an attempted assassination in 1865 (the same night that Seward’s president, Abraham Lincoln, was killed in Ford’s Theater). Finally, Jackson painted Seward’s nostrils and ear creases red to acknowledge the continued shame of an offense that has still not been put to rest. Emily Moore is Assistant Professor of Art History at Colorado State University, where she teaches Native American and American art history courses, among others. Her research focuses on contemporary and historic North American Native arts, as well as the inclusion (and exclusion) of Native arts in American and world art histories. Viola Garfield and Linn A. Forrest, The Wolf and the Raven: Totem Poles of Southeastern Alaska. University of Washington Press 1961. William H. Seward: An Autobiography from 1801-1834 (1891). The True Story of the Lincoln Pole,” Alaska Journal 1:3 (Summer 1971). Emily Moore, “The Seward Pole: Countering Alaska’s Sesquicentennial,” paper presented at Sharing Our Knowledge, A Conference of Tlingit Clans, Sitka, Alaska, October 15, 2017.